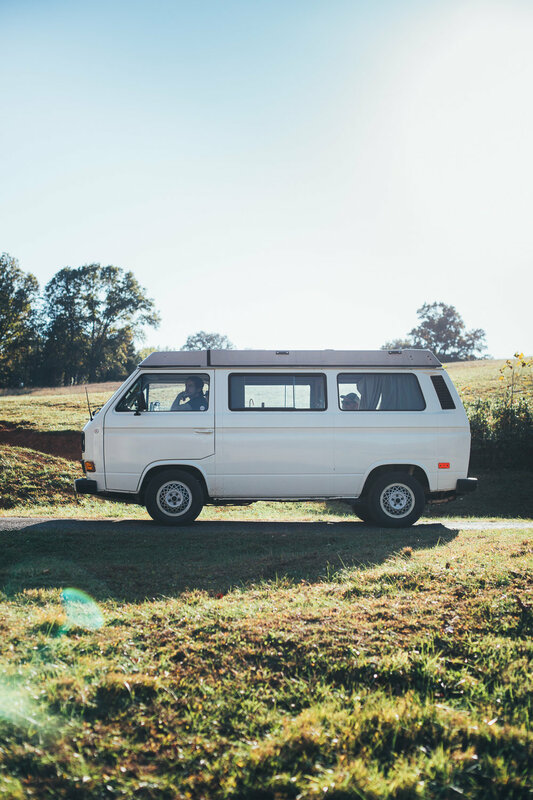 We bought a freaking VW VAN! With a pop up tent! We have evolved into our truest hippie forms! There's taupe carpet on the floor and on the dashboard! A mattress folds out of the back seat! There's another fold out mattress up top! THERE'S A SINK! And the best part... we named it Cashew! Oh we love baby cashew. We like to pat him and drink coffee in him and look adoringly at him parked in the front driveway. He's very cozy to sleep in. And he makes us giggle like little kids because dude it's like camping in a giant toy car. We've taken Cashew out for two spins so far. So this weekend's wander was our second venture out. 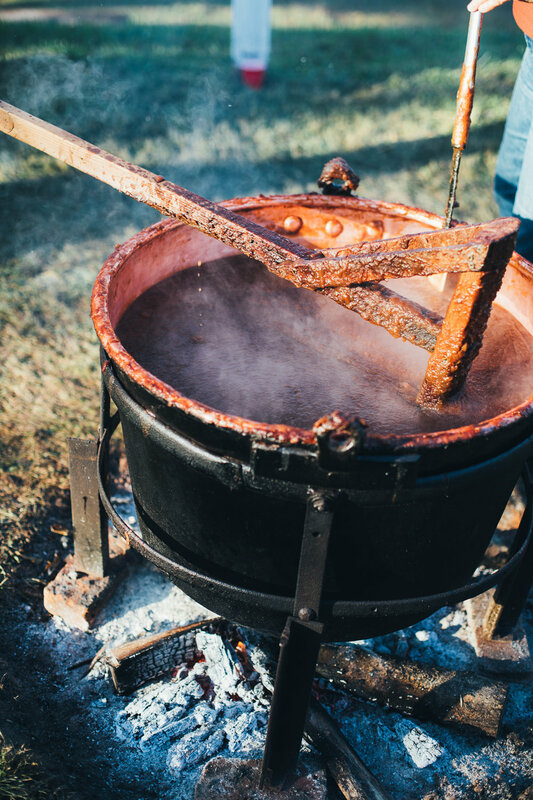 We got invited to "Apple Butter" -- an annual, invite-only family fest all about sharing the work involved in making tons of apple butter and cider. 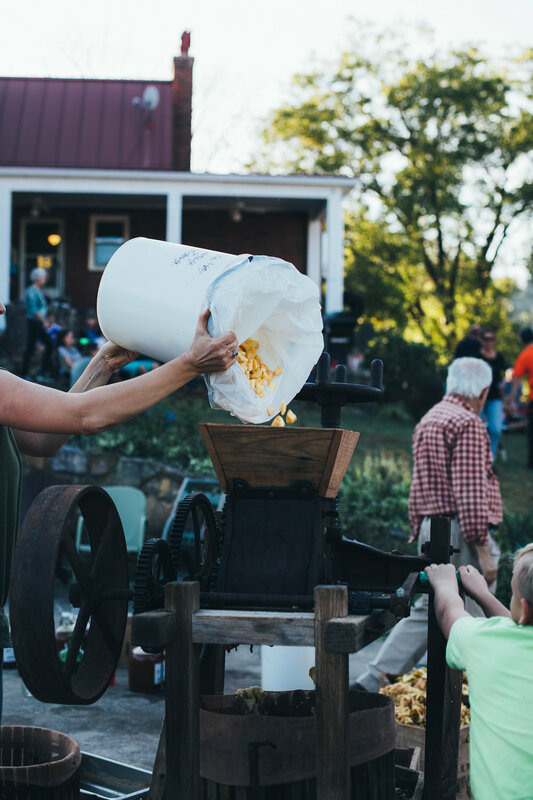 It's a Friday-Saturday thing, and they make both the apple butter and cider in traditional, wooden, hand-crank presses. The apple butter is cooked over a fire for about a day. 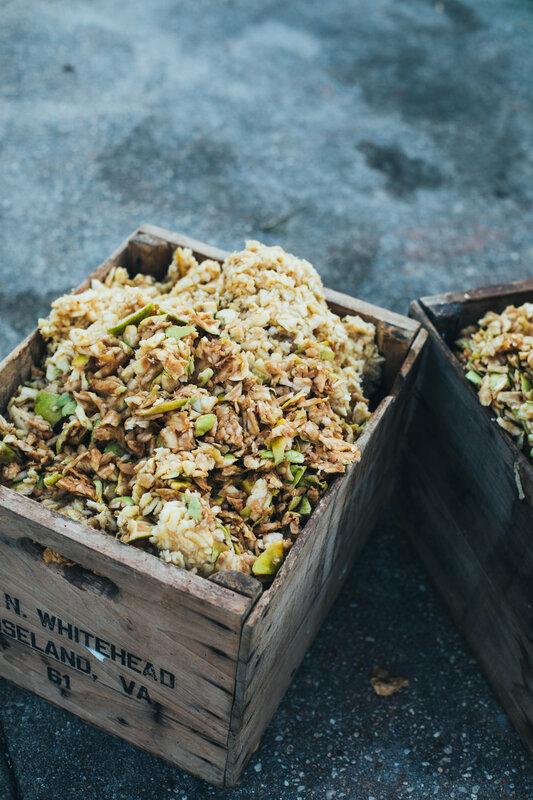 And everyone chips in on the stirring, apple pressing/crushing, fire stoking and general good vibes. Everyone also drinks a lot and eats their body weight in chili. That's just how it is at Apple Butter. Apple Butter is in Nelson County. It's a dream-world there in October. The light is insanely gorgeous. The trees turn gold and red and mulberry-purple. Oh and how was everybody's halloween? I feel like I barely celebrate it these days, even though it's totally one of my favorites! I guess we celebrated the shift between the light and dark seasons in our own way. With gluten free beer and sunset gazing. More importantly, Halloween is Logan and my date-iversary! The first date we ever went on... I made butternut squash soup for us at my college house and we totally made out. We get really squishy romantic about it. 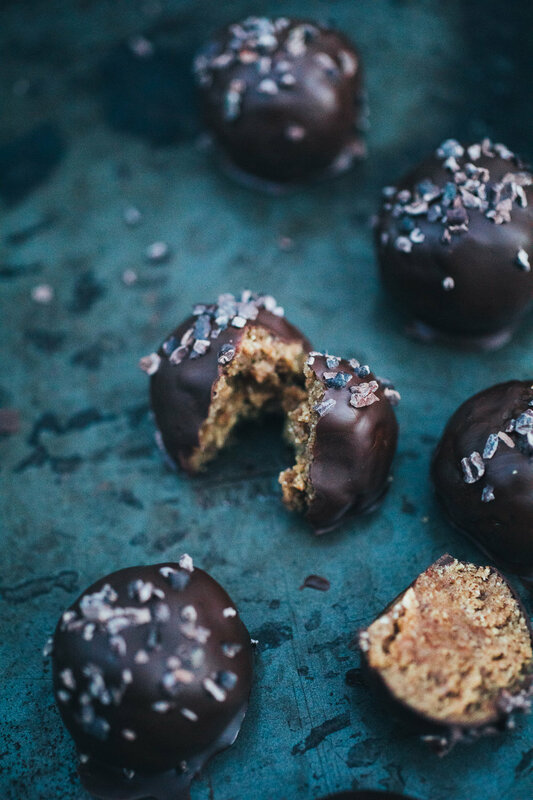 Also this past weekend I made some homemade "snickers" truffles... peanut butter date caramel centers, oat-almond butter nougat, chocolate coating with nibs on top! I'm working on them for the blog! 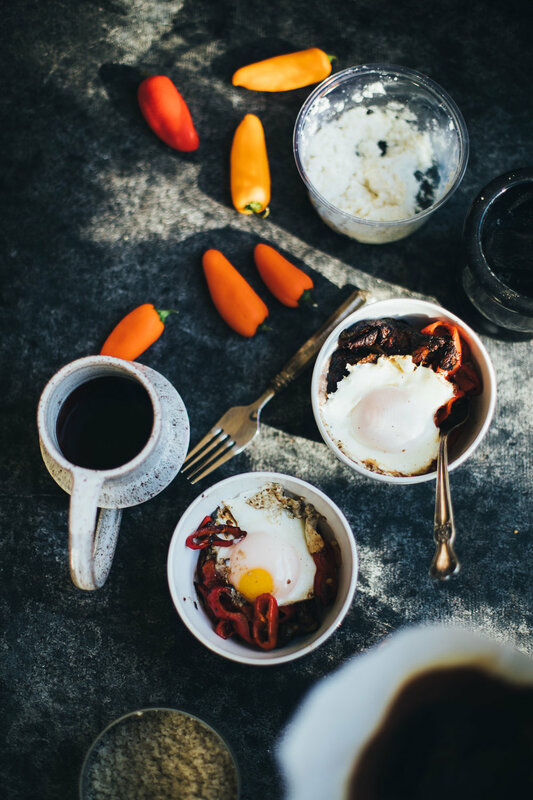 Runny sunny side up eggs over savory teff porridge with raw goat feta and sautéed peppers! Rice cakes with baba ghanoush, chèvre, apples and honey! Sounds like a weird combo but it's gooooood. It'd be even better on sourdough toast. 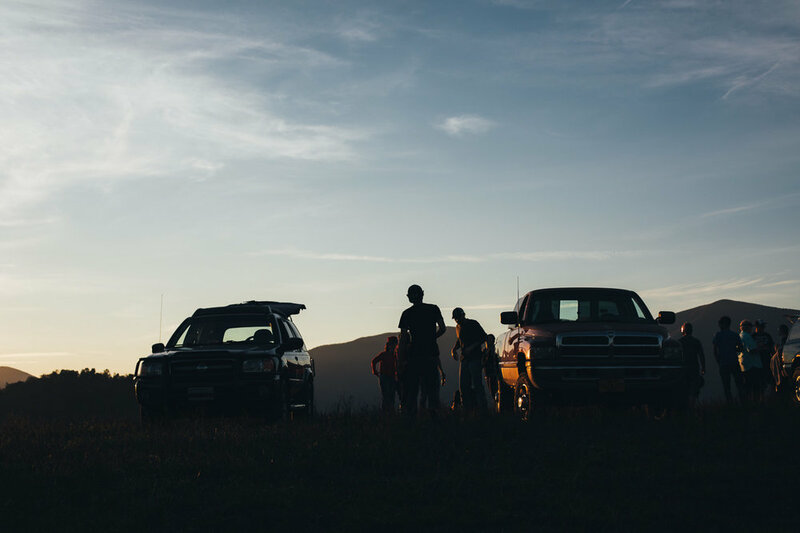 How are you getting your wander on this weekend? And are you planning on making anything delicious? I'm hoping I'll have time to test some persimmon muffins and apple hand pies. Share what you're planning on doing / making in the comments! The DIY Almond Milk Hack!